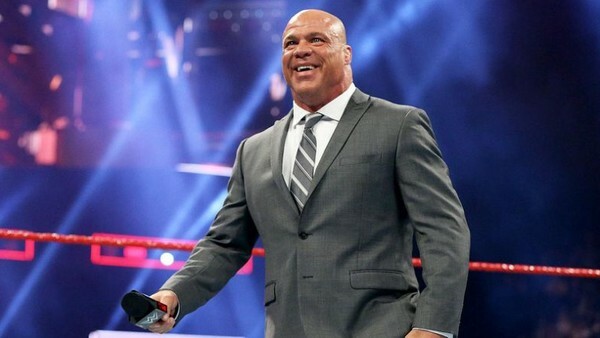 RAW General Manager Kurt Angle could be set for a shock return at WWE's Super Show-Down pay-per-view event this weekend in Australia, according to Ringside News. "Everybody wants to know what's happening with Kurt Angle. He has been contacted...Kurt Angle may be appearing at the Super Show-Down, believe it or not." Angle hasn't been seen in WWE since Stephanie McMahon ordered him to take an enforced vacation in August, following Ronda Rousey's attack on the RAW Commissioner. Since then, Baron Corbin was promoted from Constable to Acting GM, and has made some questionable subsequent decisions. "I think it's one of those things where it will definitely happen. Knowing Kurt and knowing how frustrated he can get, an I can bee quite the aggressor myself. It's one of those things where whether WWE want it to happen or not, it may happen." Angle last competed in a WWE ring at the Greatest Royal Rumble as a part of the battle royal, but since his return to the company in 2017, he is yet to have a singles match, something which is highly-anticipated by fans.